I quite often come across photo’s online of people food prepping for the week ahead with huge trays of food ready to be roasted and every size of Tupperware you can imagine. I would say for a lot of people, myself included, that you want to make the most of your Sundays and although I admire those who can prep every meal for 7 days I just don’t have the time or room in my fridge! Preparing anything in advance doesn’t have to be extensive, just getting your snacks prepared is a great little timesaver for the week and it’s much easier to have a healthy diet if your snacks are healthy and all ready to go! 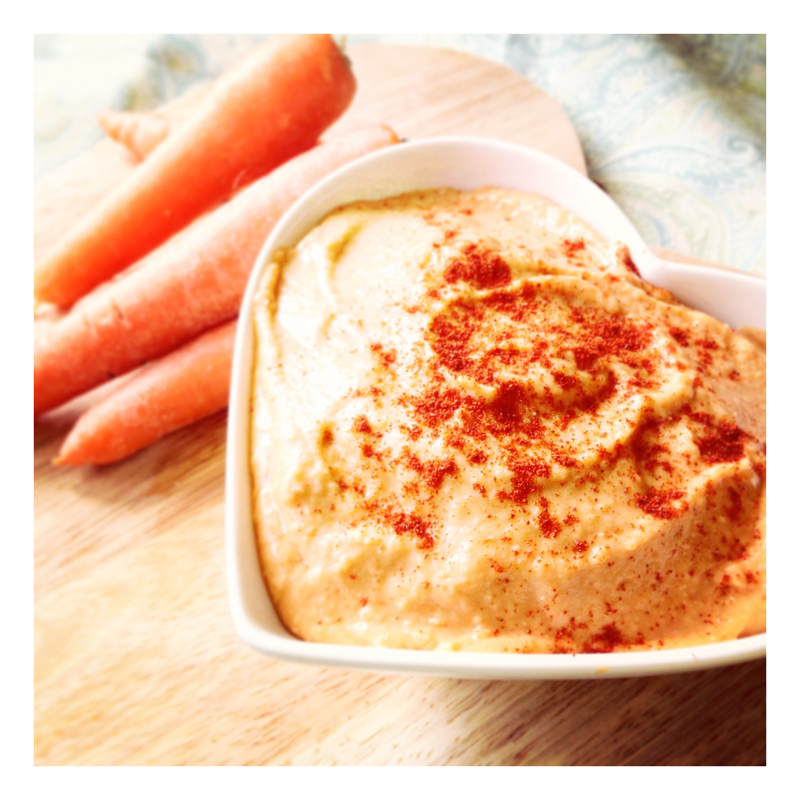 I will be adding different snack ideas on the blog but carrot sticks and hummus are one of my favourite’s, as it increases my raw veggie intake, it’s really tasty and super healthy! If you don’t have carrots at home you could always substitute with celery sticks, mange tout or sliced peppers. I tend to use carrots because they are really cheap so I usually get a big bag and use some for freshly pressed juices as well as in salads or dinner recipes. Even something simple like grating some carrot into your salad gives it a new texture and vibrancy. There is also a bit of truth behind the old saying “carrots help you see in the dark” as I was always told growing up. The Beta-carotene found in carrots which gives them their vibrant colour is turned into Vitamin A when digested. Vitamin A is required by the body for our immune system and those who have a deficiency can often have problems with their sight, which is why carrots help to maintain healthy vision. Chickpeas are great too as they are cheap, filling and high in protein and as they have a low GI they will not spike your blood sugar meaning you will stay fuller for longer. Plus they are so versatile, I use them in so many different ways and they are a great staple to have in the cupboard for bulking out a meal or when you are running low on fresh veg. Drain the chickpeas of any water and throw them into a food processor along with the whole garlic clove and all other ingredients and blitz up until smooth…that’s it! This is the easiest thing to make ever and is so tasty you won’t want to buy shop made hummus again. Sometimes I will omit the sweet chilli and smoked paprika and flavour the hummus with something else which may be to suit whatever you are making for dinner or just to mix up what you have for snacks. All you do is mix whatever you like into the top 4 ingredients in the list. Examples: a tsp. of pesto, cumin and coriander, Moroccan spice mix (you can pick up in almost all supermarkets), roasted red peppers or sun-dried tomatoes. The tahini paste is quite an important part of the hummus and it gives it quite a distinct taste. You can buy it from places like Holland and Barrett or other health food stores and it’s not particularly expensive considering the size of the jar and how little you will use which is good but you can make it without, it just won’t taste as much like traditional hummus but still makes a lovely dip! I haven’t made hummus in a while so will try your recipe for the smoked variety. I agree with you about using up those Sundays to do a few days ahead prep – I store in small plastic tubs in the fridge so you don’t have to reach for convenient style unhealthy snacks!! Keep up the blogging.